KOTA IS not just a bunny chow, but a true definition of togetherness, because you find everything inside a quarter of bread and when you eat it, you eat everything at the same time . 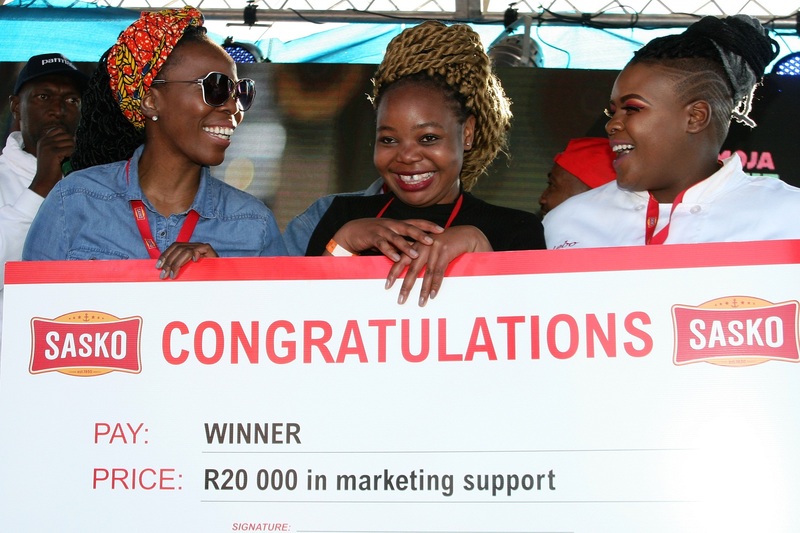 . .
2018 Sasko Soweto Kota Festival first prize winner, Fortune Takaringwa of church caterers, Blue Sky, received a dummy cheque on behalf of her team at the Sasko Kota fest, held in Soweto. All images Jacob MAWELA. The statement spotted at a clothing brand stall interspersed somewhere within myriad others occupying an early Spring Saturday afternoon on the Walter Sisulu Square of Dedication in Kliptown – pretty much lay testament to how a township lifestyle concept has spawned an economic driver way well beyond comestible! It is the copyright of Ekurhuleni duo, Nkululeko Malinga and Quinton Gumede, sophisticated co-founders of a fashion label aptly named: KOTA! To slot commercial matters – according to part of the textile line’s declaration – into perspective, kota is an umbrella for young, up and coming “Black owned business”, be it a car wash at a busy spot or that kota pozi, art and culture organizations owned by young black and talented people. The Daveyton-based disruptors couldn’t had been more precise in their economic assessment of the potential of the comestible invention. And one man who made the eclectic rendezvous possible, was none other than enterprising events organizer, Sidwell Tshingilane – who was realizing the second installation of the gourmet gathering. Keenly walking to and fro across the square’s layout and invariably in the esteemed company of the deputy minister of tourism, Elizabeth Thabethe or attending to vendors’ issues – Tshingilane expressed satisfaction with the numbers, pointing out that the opening day’s visitor figures already surpassed those of last year’s two-days, combined! The vista on the location of the 1955 congress which culminated into the drafting of the historic Freedom Charter, unambiguously laid manifest that souls from far and wide, voted with their feet. With aromas wafting and hanging in the air above and adjacent to the Soweto Hotel, some 4000 plus young and old, families and fraternities filed-through [a plethora of camp chair bags slung over shoulders] the gates on the festival-prismed day. That figure, enthused Tshingilane, translated to a 50% increment in attendance, and in comparison to the Soweto Theatre-held affair of 2017. It was a conversation of digits as the down-to-earth organizer pointed out that it cost him R34 000 to run the event but that the detail of the festival reflected a win-win for all involved. The arithmetic stood that an entry fee ring-fenced at R70 per 4000 adult attendee equalled five figures above the quarter million mark. And with the hamburger variation not coming any cheap [vendors charged between R50 and R100] and exotic cocktails [contained in some of the most fashionable orifices imaginable] costing upward of R200 – this was a verily serious financial market! Small wonder that the CEO of Tourism South Africa Sisa Ntshona was also guesting. The festival layout meticulously divided into arts& crafts, cocktail bars and kids’ entertainment areas – the lion share of the space was taken up by an impressive 45 Kota stands. Equally impressive were the vendors presentations, with fare served on rusty-edged enamel plates and branded greasy paper. At zinc iron shack stall run by uThokozene, one would even get a seafood quarter stuffed with ingredients such as mussels and prawns. A R50 offering of theirs contained cream spinach, Greek salad and chicken gizzards – with the mounted filling topped by a chicken foot for creative measure! And former sports journalist, Lesiba Langa (City Press) the lanky lad is to be found behind a mobile bar, religiously immersed in the chemistry of liquids, their colours and the infusion of potent ingredients. The proprietor of a very visible brand named after his family name, viz-a-viz Ulanga Bar, the hands-on mixologist in the beverages sector has introduced the sort of presentation which evokes images of surfers’ shorts and bikini-clad company stepping out of the ocean and onto white, soft sand – headed for a welcome chilled liquid fix under a burning sun. Langa’s fantasy evokers have even begot names [as one would suspect of the imagination of a businessman with a parallel career revolving around letters] such as, Gale Phirimi, Hlaudi and Ko Mokokotlong! Incredibly for him, queues of throats thirsty for quenchers winded around other stalls, to his! 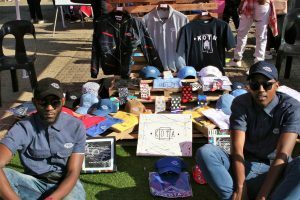 Kota fashion label co-founders, Nkululeko Malinga and Quinton Gumede display their ware at the Sasko Soweto Kota Festival, at the Walter Sisulu Square of Dedication, in Kliptown. Spotting such a sight put into perspective the relevance and conceptualization of Tshingilane’s event – in that, although formally labelled a quarter affair, its trickle-down effect meant that other economic sectors could thrive alongside it – to everybody’s gain. Let food be thy medicine and medicine be thy food – another stall with a fresh and unusual twist to the overall approach, philosophically quoted Hippocrates, by manner of presentation. 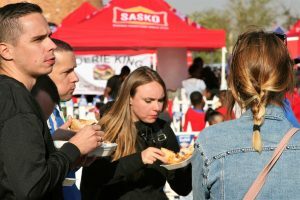 Named FOYOKO [an acronym for, food you know], the first thing which struck with the brand was that, whereas almost all of the vendors used Sasko bread [in reverence to the festival’s title sponsor] – they deliberately chose to go with soft rye bread sourced from a bakery of their choice. One wouldn’t miss the bread’s inviting ginger cake-esque brown hue – stuffed with salivating roast beef, potato ribbons and embellished with spinach and peppadew salad. And offered in the R25-R35 bracket – ‘it was healthy eating at affordable rates! With the early Spring sun swirling and the gaiety of carefree mites unleashed at the teeming kiddies entertainment zone and a sitting and dining area filled to capacity by rather deep-spending visitors wolfing down varying sustenance – a stage occupied by DJs ahead, was a hive of activity. Courtesy of Sasko, some vendors who had put in much love and effort into their offerings, had to be rewarded. 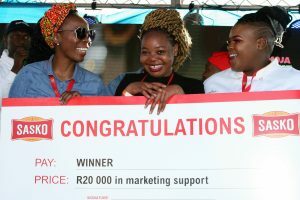 Their creations having been sampled by a panel of knowledgeable judges, numbering chefs among them, three caterers, namely, Blue Sky, Loma Monate and Lamb and Mutton – walked away with prizes of R20 000, R15 000 and R10 000, respectively. Not the quarter’s usual gourmet – all races too, came to witness the Sasko Soweto Kota Festival, who enthusiastically tucked into a different palate poser. 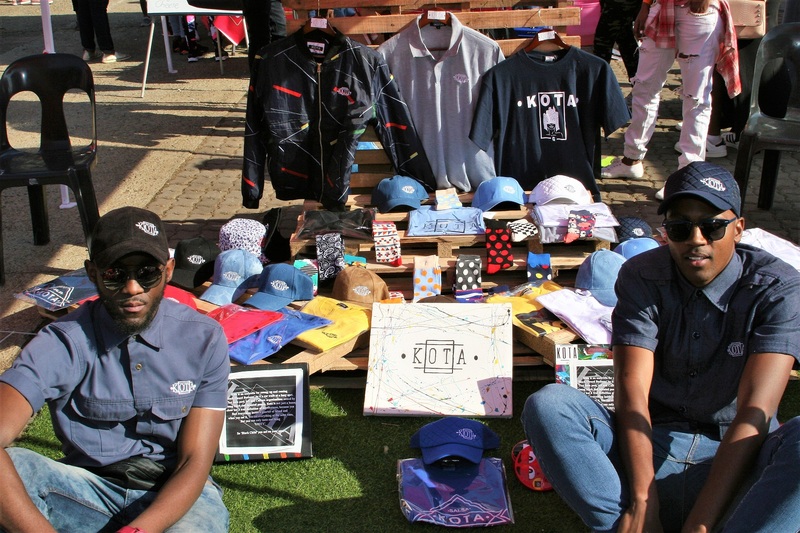 In the arts & crafts space, Malinga and Gumede offered KOTA brand happy socks, jacket, hoodies, golf t-shirts, caps for prices ranging from R100 to R300. Malinga pointed out that their one and a half year business had to be considerate about its market’s pockets. At events such as the Kota festival – they realized sales of up to 500 items. Sunday was still a night away and visitors once again voted with their deep pockets! Thoughtfully, the rider to the Kota fashion label statement concluded: but you can only taste one thing, “Unity”- so, black child, you are not on your own! Tshingilane had indeed brought residents, visitors and businesspeople under an umbrella of unity to contribute towards a besieged economy.